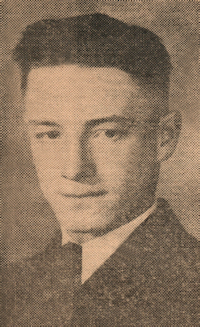 Obituary – Steichen, John Henry « Perry High School Alumni Association, Inc.
﻿- son of Mr and Mrs. John Steichen of Perry was born in Perry on Oct. 1, 1920. Johnny attended the elementary grades at school district 29 and attended high school in Perry. During his high school career he was a member of the orchestra, 4-H club, National Honor Society and Future Farmers of America. Following graduation he expects to attend A. and M. college, majoring in agriculture. John Henry Steichen, 89, of Perry, Oklahoma, was the son of John Matthew and Maude Celestine Schiltz Steichen. He was born on October 1, 1920 in Perry, Oklahoma and departed this life Sunday, March 21, 2010 in the same home from which he began his life on Sunny Slope Farm. John attended the one room Sunny Slope School from the first thru eighth grade. He was a 1937 graduate of Perry High School. He received his Bachelor of Science degree in Agronomy from Oklahoma AM in 1941. 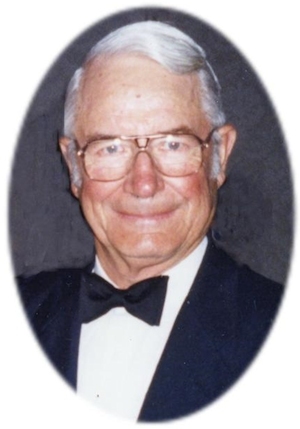 John was a member of the Oklahoma State University Alumni Association and was named Master Agronomist in 1964. On August 22, 1946, John married Ione Elizabeth Schroeder in Stillwater, Oklahoma. She preceded him in death on July 22, 2002. John was an active member of St. Rose of Lima Catholic Church he served as a Eucharistic Minister and on the Catholic Foundation Board of Directors. He was a Fourth Degree Knight in the Knights of Columbus. He was a past president of the Perry Rotary Club being honored as a Paul Harris Fellow. He also served on the Board of Regents for Northern Oklahoma College and Stillwater Savings and Loan Board of Directors. He was a member of Perry Farmers Coop Board for 18 years and was on the Oklahoma Grain Dealers Association Board of Directors serving as president in 1972. He helped establish the Morr Water District where he served as president. He was the general superintendent for Noble County Free Fair for 3 years, and was a 4H and FFA Adult Leader. He also served on the Black Bear Precinct Election Board. John was a lifelong farmer-rancher on Sunny Slope Farm, which was named an Oklahoma Centennial Farm in 2009. He served our country as Captain for the United States Army Air Corps working as an aircraft maintenance officer, from 19421946 during WWII. His tour of duty took him to the South Pacific, New Guinea, Philippines, Rykyus Islands and Solomon Islands. John was an active member of the American Legion for over 60 years, and was a farm training instructor for Veterans from 1946-1950. A rosary will be held at 7:00 p.m. Tuesday, March 23, 2010 at the St. Rose of Lima Catholic Church. A Mass of Christian burial will be 10:00 a.m. Wednesday, March 24, 2010 at the St. Rose of Lima Catholic Church. Father Tom Dowdell will officiate. Interment will be at the St. Rose of Lima Catholic Cemetery. Services are under the direction of BrownDugger Funeral Home. Memorials may be made to the Hospice of North Central Oklahoma or the Leukemia and Lymphoma Society in care of BrownDugger Funeral Home, 1010 N. 7th Street, Perry, Oklahoma 73077. John is survived by two sons, James M. Steichen and his wife, Marie, of Manhattan, Kansas and Dennis Steichen and his wife, Carol, who continue farming Sunny Slope Farm in Perry, Oklahoma four daughters, Elizabeth Bailey of Edmond, Oklahoma, Marilyn Seagraves and her husband, Ed, of Lombard, Illinois, Evelyn Otto, of Ponca City, Oklahoma and Carol Dvorak and her husband, Scott, of Perry, Oklahoma nine grandsons, John Seagraves and his wife, Michelle, Jim Seagraves and his wife, Megan and Tom Seagraves, all of Illinois, Brian Bailey and his wife, Erin, and Kevin Bailey and his wife, Allison, all of Oklahoma City, Oklahoma, Joe Dvorak and his wife, Tanya, of Manhattan, Kansas, Justin Dvorak, of Perry, Oklahoma, Jeff Steichen and his wife, Marylynn, of Wichita, Kansas and John Mitchell Steichen, of Perry, Oklahoma eight granddaughters, Christine Steichen of Escondido, California, Laurel Steichen and her husband, Jeff Lamb, of Seattle, Washington, Bethany Steichen, of San Francisco, California, Gayle Otto, Stacia Otto and Sheralyn Williams and her husband, Andreacute, all of Tulsa, Oklahoma, Kelle Otto of Ponca City, Oklahoma and Allison Dvorak of Tulsa, Oklahoma six great-grandchildren and one brother, Bob Steichen and his wife, Margaret, of Tonkawa, Oklahoma two sisters-in-law, Ruth Steichen of Ponca City, Oklahoma and Kay Lovell and her husband, Everett, of Glencoe, Oklahoma. He leaves behind a legacy of faith and love. His six children, seventeen grandchildren, and six great grandchildren were deeply blessed by the example and the strong foundation provided by both John and their mother, Ione. He was preceded in death by his wife, Ione Steichen, one son, Raymond Steichen, one grandson, Herman Otto, his parents, one brother, Joe Steichen, one sister, Mary Lou Klein, and one son-in-law, Sherman Otto.